Have you ever experienced such over powering beauty, love and hope that your heart swelled and your eyes welled up with tears of joy and sorrow? Tears of joy from profound gratitude and yet sorrow for all the years you’d walled off this beauty. 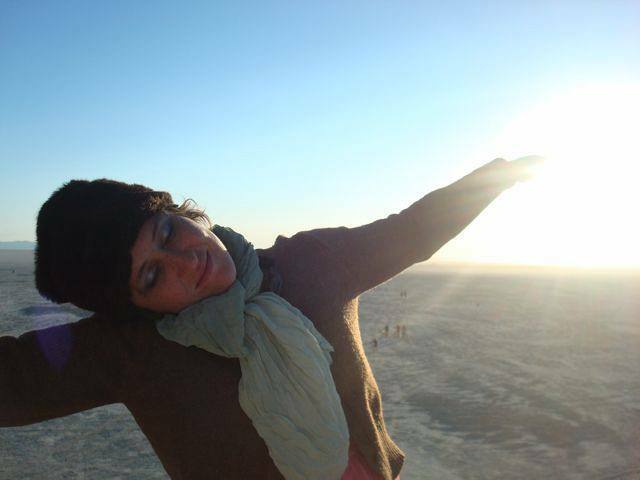 It happened to me one morning in the Nevada desert as the sun rose over a mountain ridge. When my tears finally flowed, it was as if a lifetime of pent up emotion broke through a crack and then burst the dam that had held back my emotion. Beyond choking back emotion in a dark movie theater, I can’t recall any other time I cried. It must have been some time during my childhood. I grew up in a family that swallowed their emotions like a lump of peanut butter. We didn’t hug and we didn’t feel the need to say we loved each other. It was assumed that despite the disharmony and anger between my parents that we all loved each other. I spent most of my life waiting to leave. But when I left home I took what I learned with me, along with a dark sense of humor and a shield of sarcasm. I was crippled and didn’t realize how badly until recently. 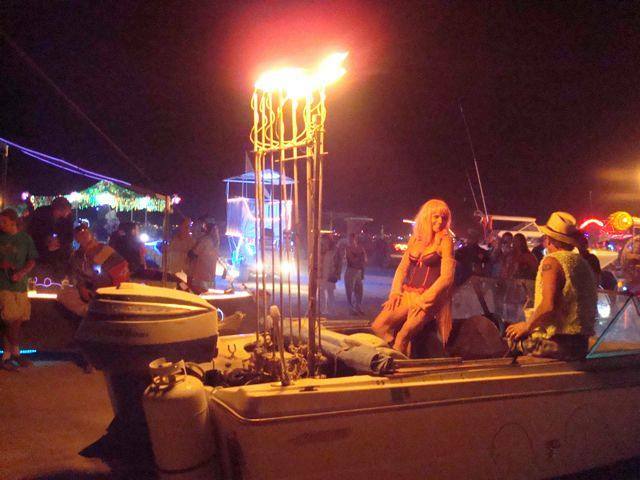 I never expected to experience anything at the Burning Man Festival that would move me to tears. 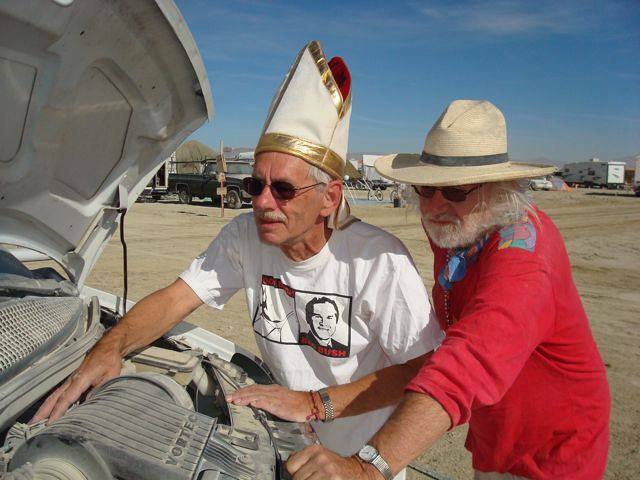 But the dam began to crack as soon as I got to Black Rock City. 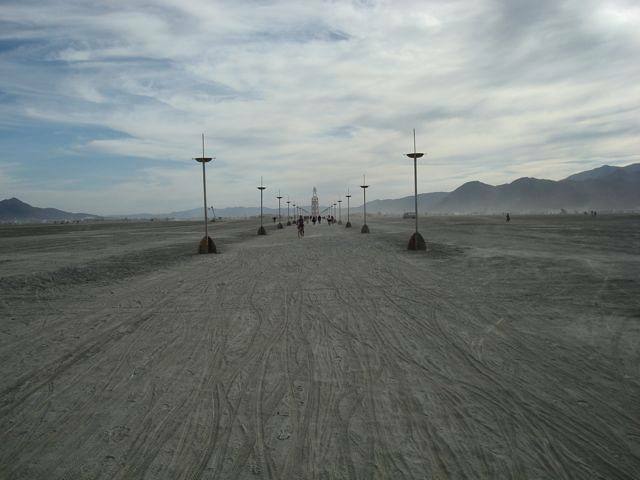 Black Rock is a “city” that is created temporarily each year to host the seven day Burning Man Festival and provide services for its 50,000 participants. It’s a fantastic place where the residents have plenty of time to play with each other and where no money is exchanged and virtually everything is given freely (“gifted”). People don’t transact with each other – they interact. The “coin” of this realm is spirit and personality – not money. Entering into Black Rock is like taking a portal into another Universe. 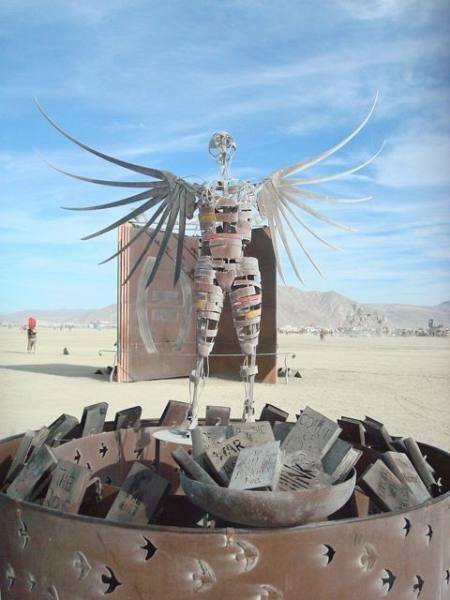 To me Black Rock City is the “City of a million delights”. 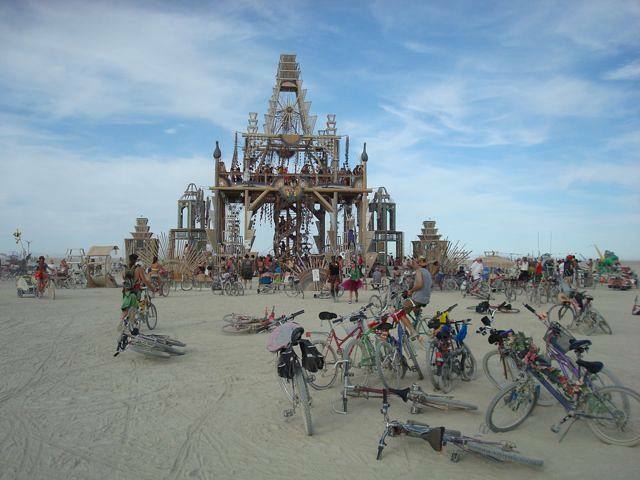 On my first day I drove across the desert following a caravan of pilgrims on a dirt road leading to Black Rock City. Our long convoy of vehicles was hit with what I later learned was the worst blinding dust storm in years. As I crept along in my motor home, I glimpsed a fire truck hosing down the charred remains of a motor home burnt down to its frame. 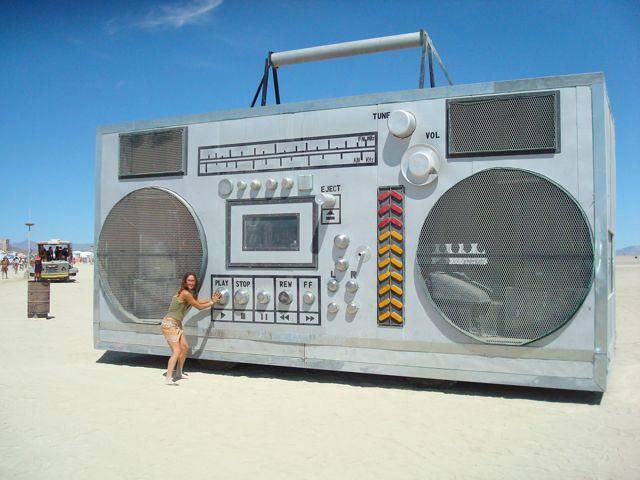 I had heard about the devastating effects of the dreaded “playa dust” and its insidious ability to infiltrate mechanical and electronic devices and destroy them. There by the grace of God was I. The drive looked more like entering a war zone than a festival. But I pressed on. 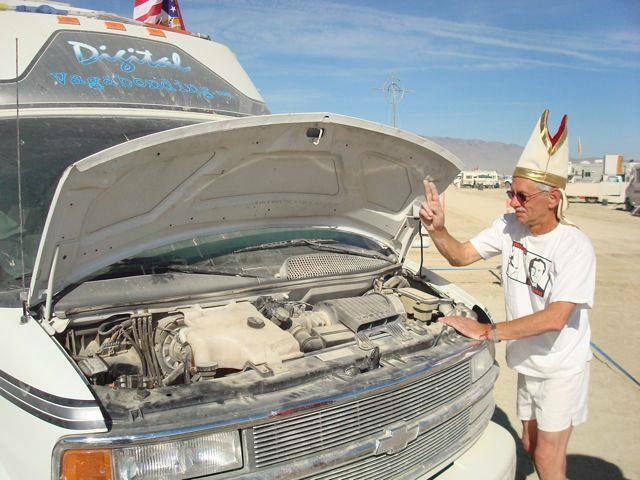 Soon after I arrived and set up camp with Ed, the author of Vagabonding in the USA, my motor home alarm began screaming uncontrollably and shrieking in tones I’d never heard. 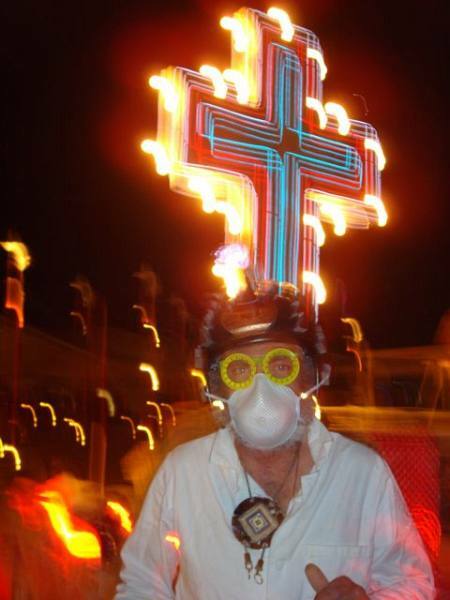 It would not stop, despite the best efforts of the pope from across the street to exorcise its demons. We cut the battery cord and, with all power to the cab now dead, I retreated into the back section of my motor home to continue on auxiliary power. 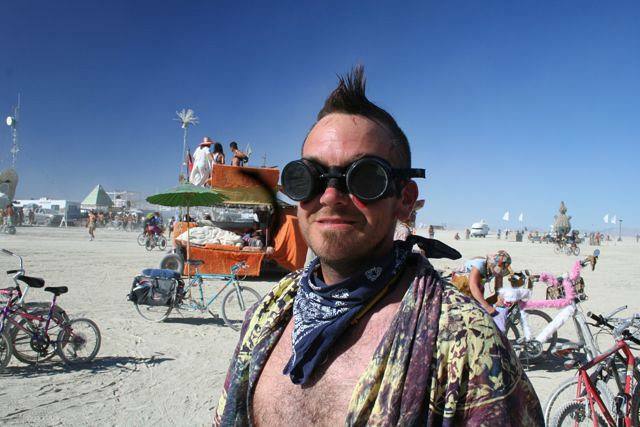 But in the spirit of Burning Man, a man emerged from the clouds of dust and introduced himself as a mechanic. He spent the next couple of hours crawling around under my dashboard in the desert heat until he disarmed my alarm and restored power to my cab and ignition. He did his work with joy and love and without any expectation of anything in return. 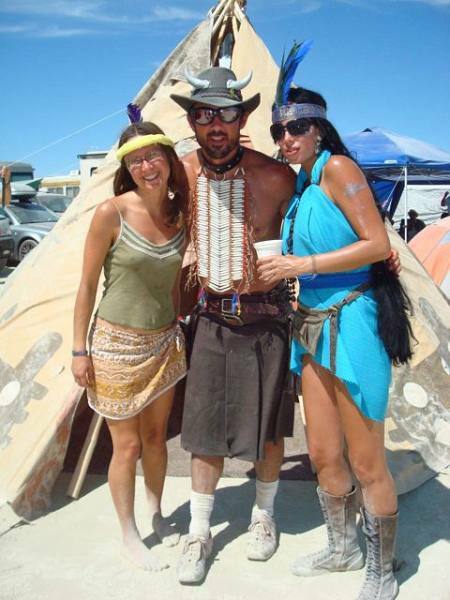 It was my first encounter with “gifting” and the camaraderie that comes from pulling together to not only survive on the dusty desert playa but to thrive. My deep appreciation of this man’s generous gift was perhaps the first tiny fissure that prepared my heart to crack open. Each day was full of new miracles, acts of kindness and compassion, acceptance, beauty, delight, surprise and joy – all of them chipping away at the wall around my heart. But a lifetime of barriers is not easily torn down. 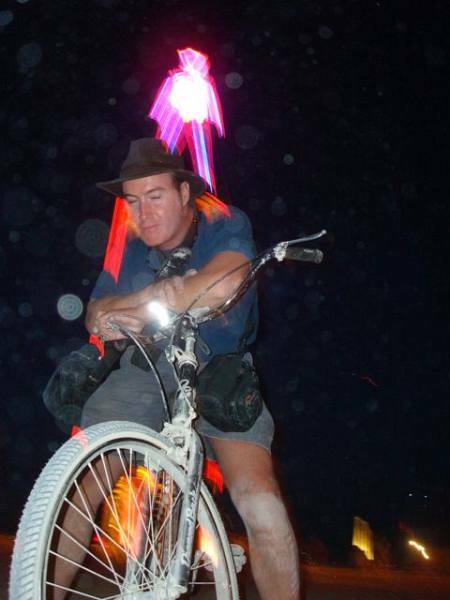 A few days and nights into the Burning Man Festival, I rode my bike one night out into the vast desert playa. 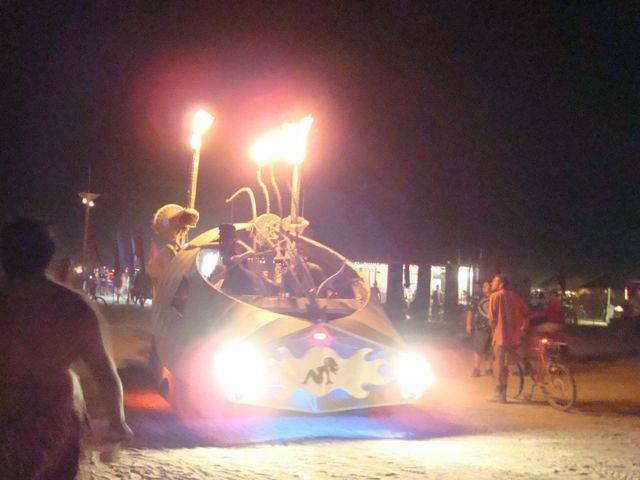 Brightly light art cars, mutant vehicles, boats and mobile nightclubs shuffled across the playa, with some belching flames into the night air. 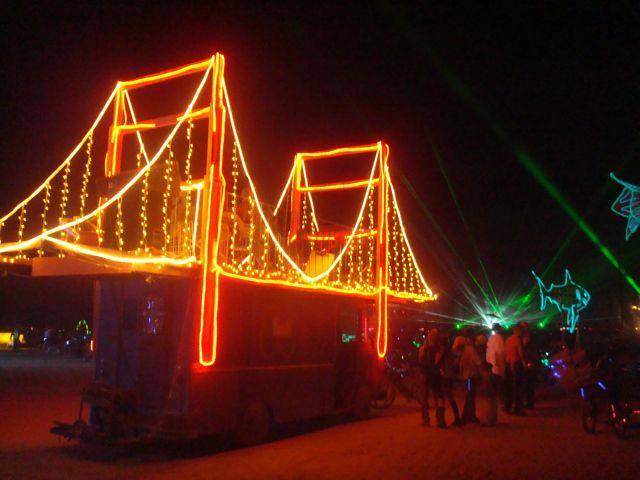 I stumbled upon spaceships, music shows and impromptu parties everywhere. All sizes and shapes of humans grooved and bobbed on waves of surging music that washed over us all like rhythmic waves. 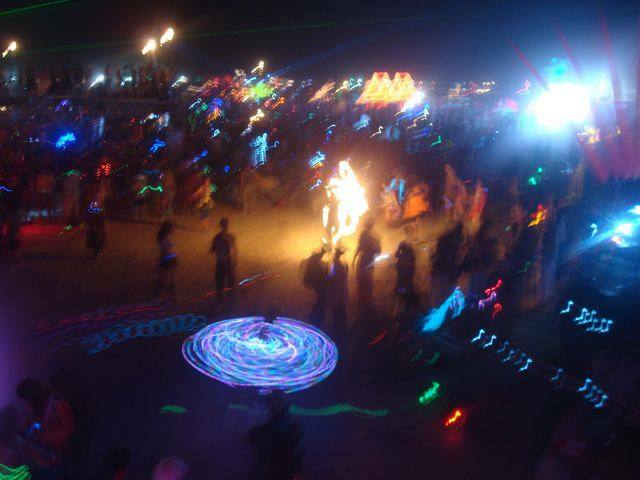 It was a joyous symphony of pulsing lights, penetrating music and dancing souls. The night show receded as the faint gentle light of the dawning new day came up over the mountains on the horizon. The music and dancing continued to flow and I stood still in the dawn light watching and feeling this incredible show flow around and through me. 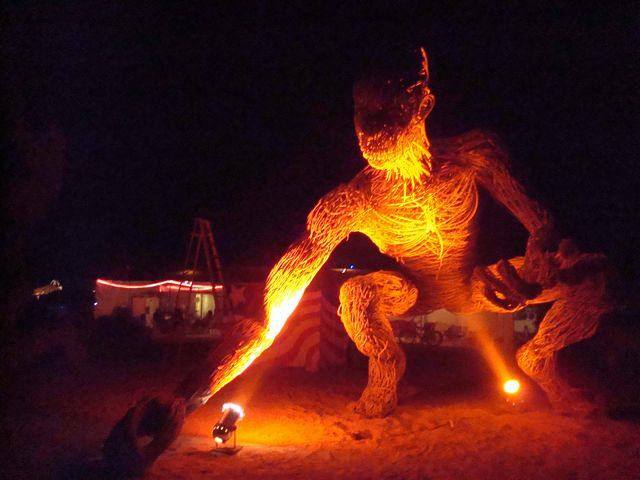 An elegant man in a white tuxedo with a ruffled shirt walked in from the desert playa and stood before me. He took my hand and with an elegant Spanish accent he asked me to come with him as he gestured to a fantastic double decker bus. 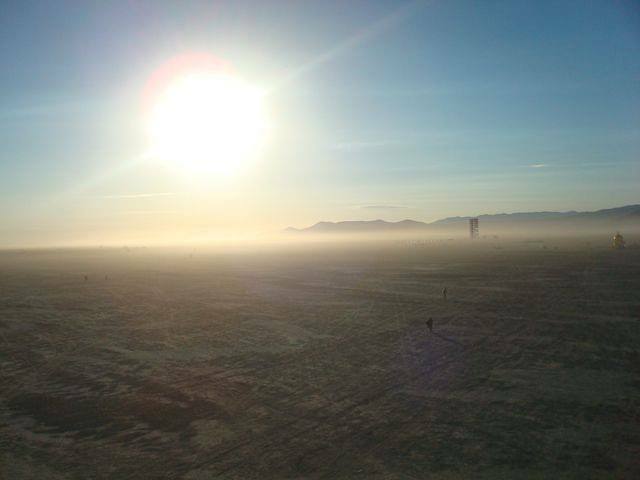 After a few days in the playa I had learned the futility of making plans and came to trust in serendipitous fate, chance encounters and magic. 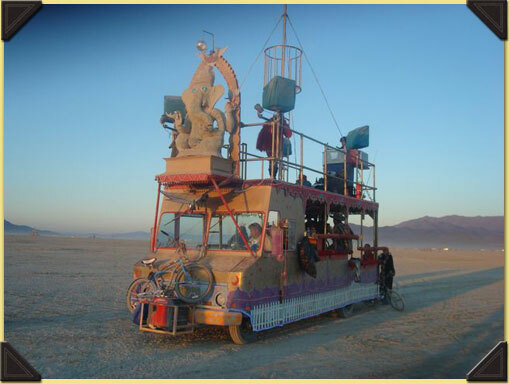 As we walked together out on to the desert playa I saw a large sculpture of the India God Ganesh with his elephant trunk mounted on the front of the bus. 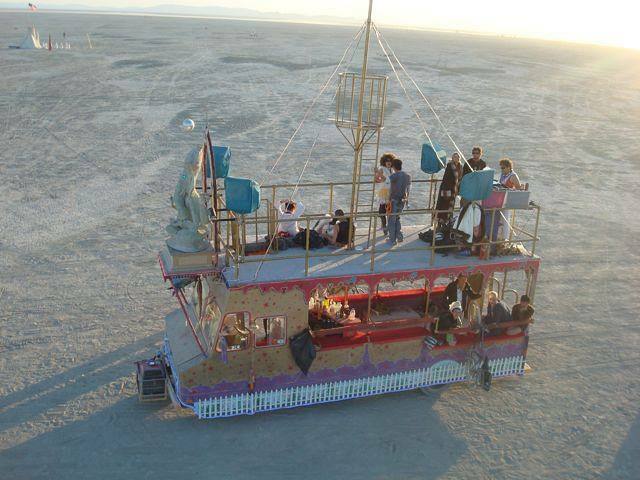 The top floor of this cosmic bus was open to the sky and funky people danced and swayed in the rising sun as a DJ spun records. A tall mast with a crows nest extended into the sky from the center of the bus and a fabulous woman grooved to the music while swinging from the mast pole. We entered the bus and the elegant man sat down in the driver’s seat. 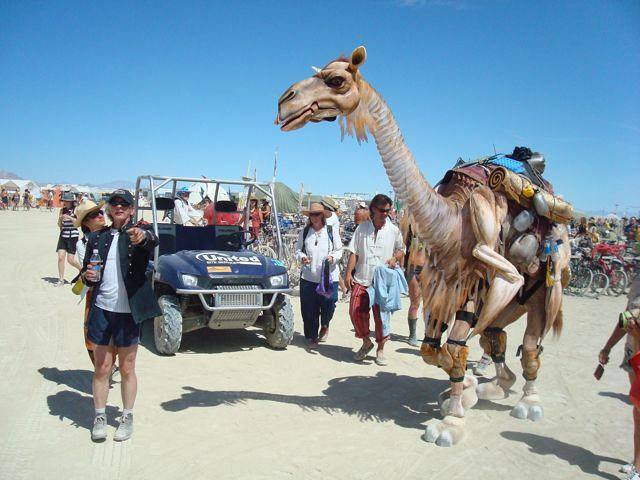 After composing himself with the dignified posture of a royal prince, he flashed a radiant and reassuring smile to the passengers, shifted the party into motion and we blazed across the desert playa heading for the rising sun. There were no glum faces on this early morning bus – only beaming faces, joy and laughter. I climbed the staircase and emerged on to the open air dance floor. The wind blew over everyone’s swaying bodies. I drank up the vision of these radiant colorful people as they swayed in the wind like blowing flowers. 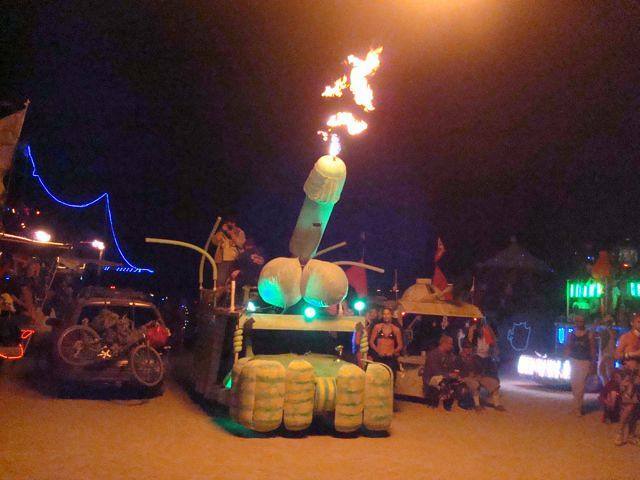 This was the ride I’d been waiting for my whole adult life. 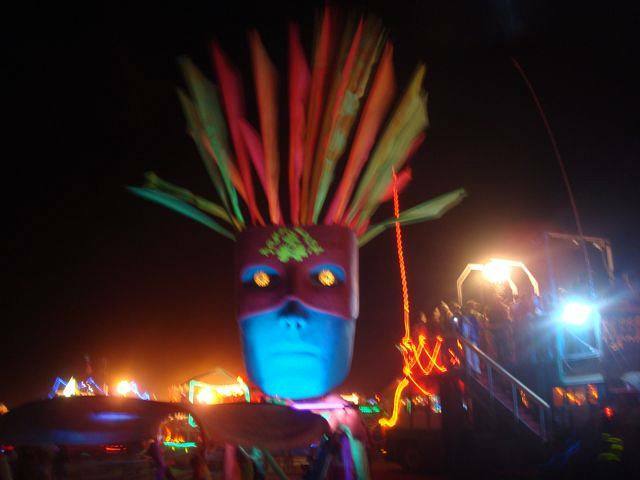 During the Reagan 80’s, when I was 21, I read “The Electric Kool-Aid Acid Test“, which told the account of some truly far out hippies who tripped across America in the 1960’s in a day glow magic school bus – spreading music, acid and love in their wake. This book had convinced me that I was born into the wrong era and that I’d missed the magic bus. 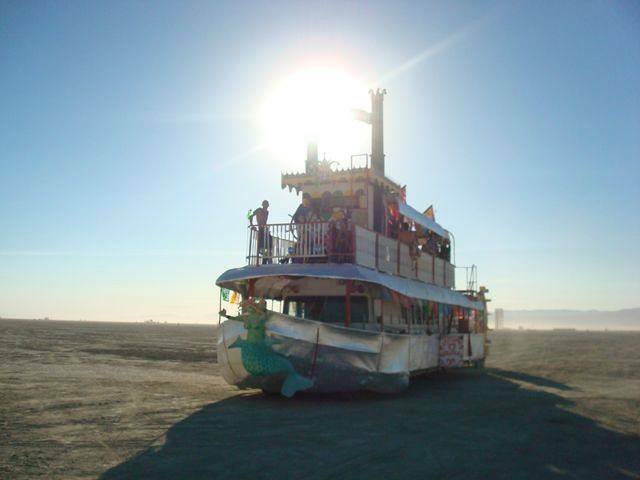 But as I felt the magic of this bus, the loving vibe of its passengers and the beauty of the rising sun on the wide open desert playa – I realized that I had finally caught my magic bus. We were blazing into a world of wide open possibilities. I knew then that there was no place or time better than right now. This was a moment so perfect that my heart became overwhelmed like a man who had been wandering lost in a barren desert and just spotted his beautiful home on the horizon. I turned my back to the party behind me and faced the sun. The soft warmth of the rising sun dissolved away the last layers around my swelling heart and tears of joy and sorrow flowed down my cheeks. 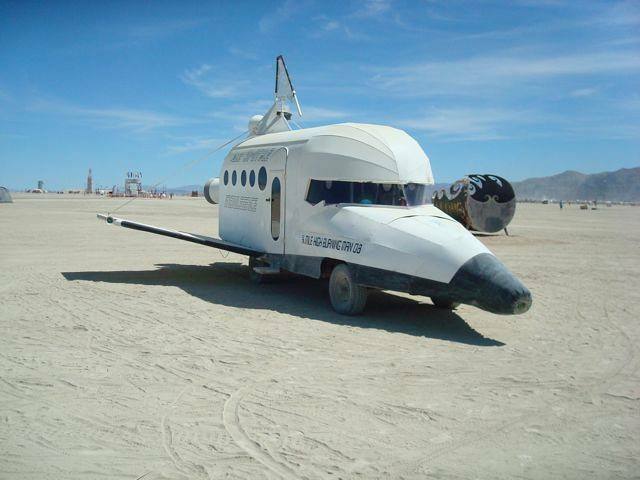 I didn’t know where this magic bus would take me. But I vowed to meet it with an open heart. The magic bus came to a stop along side a gigantic tower. 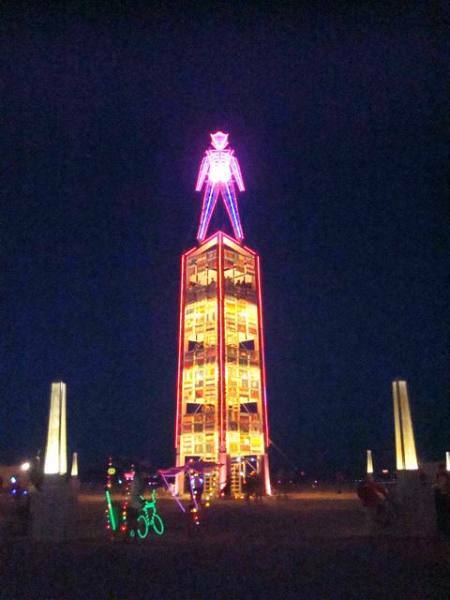 It was made like a jungle jim with metal bars that extended three stories into the sky. 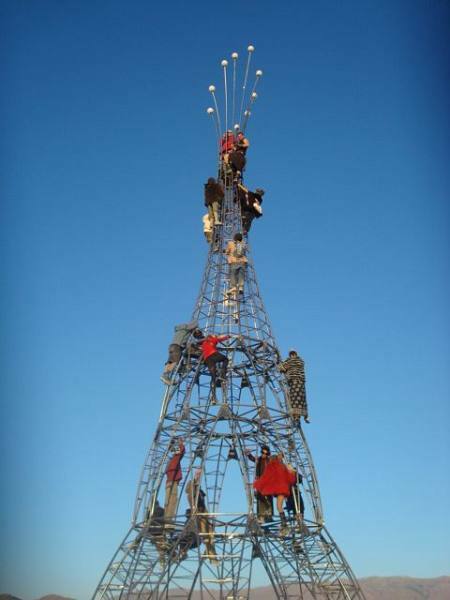 I got off the bus and walked over to this tower that was covered with people climbing the bars upward into the morning sky. I gripped a bar and felt its solid strength. I could see that the welded joints were made with great care and attention to detail. A break in any one of these welds would send a person tumbling down to the hard desert floor. 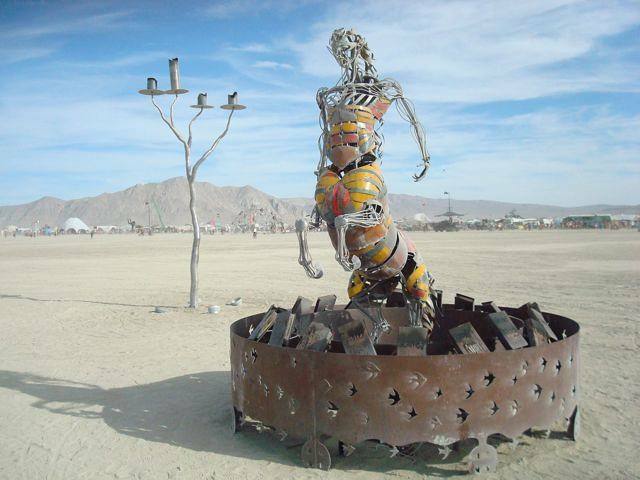 I gripped a solid metal bar and began climbing upward toward the sky. With each rung I embraced I entrusted my life to the unknown stranger who built this structure. On my way upwards into the dawn of this beautiful new day I greeted and spoke with everyone I met. Some of them I photographed. Together we were all hanging out in the open sky greeting the new day. When I reached the top I met a beautiful young couple seated in a chair at the pinnacle of the tower. I took their portrait with the desert playa stretching out beyond them. They climbed down and I watched them do summersaults in the sands and they bounded off together hand in hand across the playa toward Black Rock City. 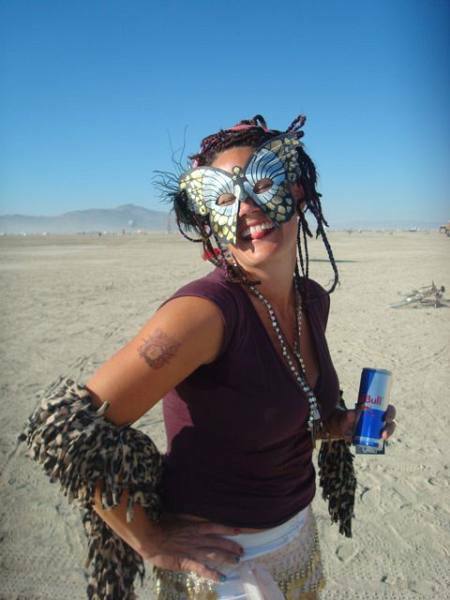 When I approached the bottom a woman wearing a butterfly mask and a radiant smile called out to me “Would you like some breakfast?” In one hand she held a bottle of yegermeister and in the other was a can of redbull energy drink. A jolt of intoxicating energy sounded like the perfect breakfast for this special new day. We laughed like silly misbehaving children as we drank our breakfast. 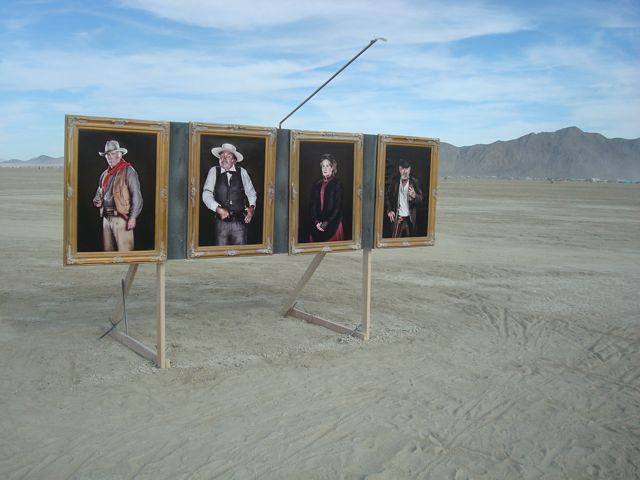 The rest of this glorious morning we wandered about the desert playa encountering seemingly random art and fabulous people. An amazing evening had morphed into a glorious new day and a fresh new beginning. My open heart absorbed its full radiant beauty and my soul was new like a child born into a world with eyes wide open. On this morning I was born again. This entry was posted on Friday, June 12th, 2009 at 3:56 pm	and is filed under California, Nevada. You can follow any responses to this entry through the RSS 2.0 feed. You can skip to the end and leave a response. Pinging is currently not allowed. I found you this morning after watching “Travel the World for Free” on TV. I did a Yahoo Search and up you came!!! 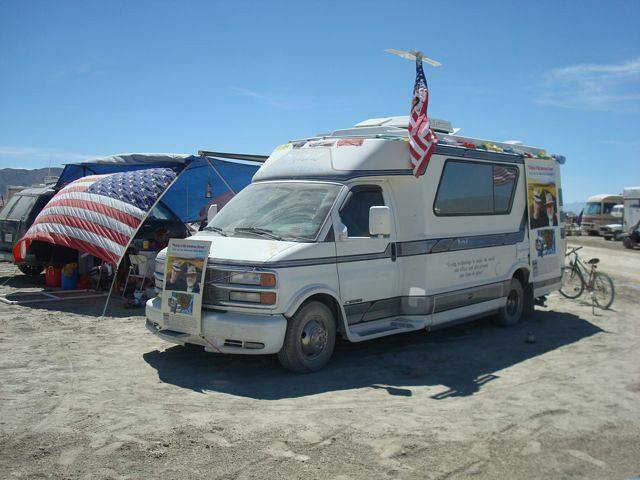 I had a friend convert a van into a camper years ago. His reason was to travel from Florida to Cali for a job. He also told me that he was going to live in it for a while after he got there. This was about 24 years ago. Since then I have traveled by road ever since. I have been yearning to travel cross-country. Now that I am unemployed, perhaps this it the time….while i am still young enough to do it….Thanks for the insperation! Ted in Fort Lauderdale, Fl. Ted from Fort Lauderdale – my last major port of call. All I can say is go west young man. The West coast is where the dreamers meet the ocean. It’s magical in Northern California. Come experience the magic. Florida is for those who want to lay around like beached whales. Sorry for the sleepy answers last night. It’s been a long hard weekend- I’ll give you a call today if that’s ok. I can’t wait to see the Magic Bus. Great post Pat! Sounds like one of those magical moments we never forget! very neat. 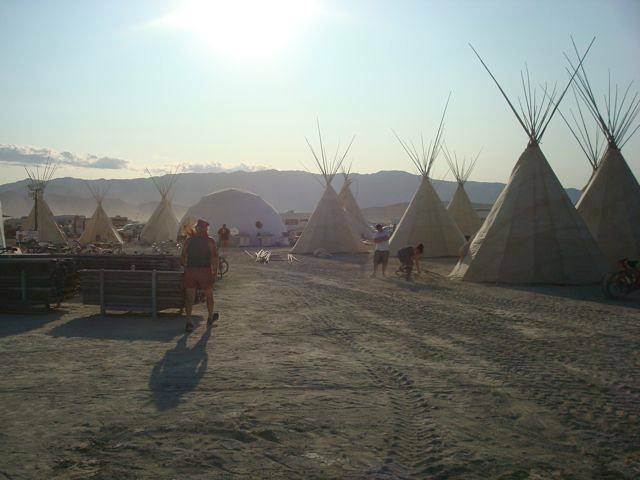 We shot a huge collaboratory documentary at BM 2008.
beautiful and touching…crying can be woinderful!